Publish your websites and ebooks on CD-ROM or DVD-ROM easily thanks to the Distribute Publication tools of HTML Executable. Websites compiled with HTML Executable require no installation and can be run directly from a CD: you only need to burn the executable file generated by HTML Executable. no installation is required, your publication can be stored on a removable device such as USB flash drive, enabling it to be used on multiple computers. settings are stored with the software (i.e. they are written to the USB drive). No registry is used in that case. no modification is made to any PC the publication is run on after being used. Moreover, a portable and restricted publication can be configured to run only on a given USB drive. Thus, copying it to another disk will make it unregistered or unusable. Steps are explained in the documentation. HTML Executable can automatically generate AUTORUN.INF files (used by the Windows Autorun feature) for you so your compiled website starts immediately when the disk is inserted. 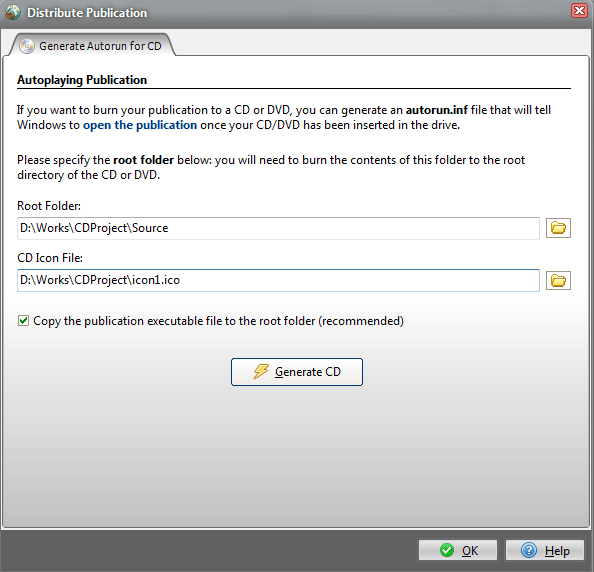 Or distribute your publications with installers (HTML Executable can create Paquet Builder projects ready to be built).